This very important site has been designated as a "significant heritage asset" by Heritage England, County and others. So far revealed by MAS, OA and others, are 3 Barrows, 2 Mortuary Enclosures, a Neolithic Enclosure (possible house), an intact Neolithic Tannery, Field Systems, a possible track and paleo channel crossing, also evidence for farming. The authorities have stated that the site is of Regional and possibly National importance. The whole area of possible activity is some 120 acres but only a very small proportion has so far been investigated. In 2009/10 the Environment Agency (EA) applied for planning permission to build a flood alleviation scheme on the site, mainly the excavation of a large lake. The proposals had two parts, the cut area containing the lake and a fill area containing the most significant archaeology to be used to dump the spoil from the lake excavation. This meant that a considerable depth of spoil would be placed over the archaeology making further investigation difficult or impossible. We made submission that the site was designated as significant and should be investigated before the spoil was dumped. This resulted in County requiring a condition on the consent allowing us access for a limited investigation. We obtained approval of a detailed WSI for these works and Colin Berks was nominated by WDC and County as archaeologist for the fill area to achieve compliance with professional standards and in association with local societies. Our approved proposals include 3 large trenches over Barrow A and B plus D1 and associated geophysics. The objective is secure datable evidence as this at the moment this is uncertain, also to investigate possible cist burials in the ditch of B and possible chambers in A and D1. Success will depend on accurate positioning of trenches which will be difficult. Appointed as trench supervisors are Ann Griffin and Roelie Reed with Peter Carver making the grant application. Yet to be appointed by MAS but equally important are, logistics, finds / context recorders, PR, Health & Safety and non archaeological management. We have spent 6 years and a lot of effort trying to sort this out. The consent had archaeological conditions regarding the cut area (lake) but inexplicably had nothing about the fill area (significant archaeology) apart from allowing access. Early discussions with EA had established the principle that they would provide specialist services (expensive) and a clause to this effect was inserted into our detailed approved WSI, also that EA would assist with mechanical equipment. It became apparent that EA intended to renege on these previously agreed principles, claiming that they had no obligation as there was no requirement in the planning consent therefore that they would provide no assistance. Although there is an outline EA WSI for the cut area this is normally followed by a detailed WSI when an archaeological contractor is appointed. At a recent meeting EA stated that they were not required to produce a detailed WSI as they had a letter from WDC of WSI approval, County disputed this and that a detailed WSI was required. We have discussed with County resolving our problems in the detailed WSI but if EA get away with not producing one we don't know what will happen. Considerable doubt was expressed by some as to how and if the alleviation proposals worked as it seemed to rely on water running uphill. In any event the levels indicated that it would not prevent Marlow flooding only preventing the flood becoming worse but there was doubt. Recently EA have stated that the proposals were being reviewed with at the moment 3 options 1) the current consent implemented (unlikely) 2) a revised scheme (requires a new planning) 3 the alleviation proposals are abandoned. EA were not clear when a decision would be taken but it seemed not for a few months. We have always had a good relationship with the landowners but understandably they have become frustrated and annoyed by the actions of EA and the authorities. We have discussed with them carrying out our investigation in the event of EA abandoning the alleviation proposals. Not surprisingly the landowners are reluctant to discuss this further until they get a categoric binding statement from EA as to what is to happen. MORE INFORMATION WILL BE SENT WHEN WE HAVE IT. The JLP Heritage Centre is a recently built, sympathetically designed, extension to an old farmhouse that resides on Odney Common, Cookham. 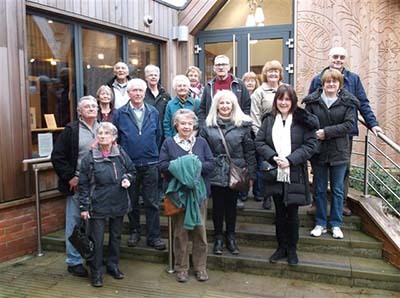 Because it is open to the public on Saturdays, some members of Marlow Archaeological Society (MAS) and Maidenhead Archaeological & Historical Society (MA&HS) were able to visit the Centre on Saturday the 14th of February. We were welcomed by two guides who showed us around the Centre and introduced us to its repository of material relating to processes that have been overtaken by today's technology (such as hand printed textiles dating back to the 18th century, over 5,000 samples are housed at the Centre), and to the image library that contains pictures ranging from staff outings to historical Partnership. To celebrate the 150th anniversary of the business a representation of the John Lewis shop front, that was part of the Oxford Street store that suffered severe bomb damage during the Second World War in 1940, has been erected in the Centre. In a room behind this reconstruction are examples of products sold during and after that period. Another reconstruction was of the small office used by the son of the founder - John Spedan Lewis. We were given a brief description of the origin of the business, particularly with reference to the influence of John Spedan Lewis and his ambitious vision of co-ownership (the workforce are known as Partners). It is largely due to his ideas, formed during a long recovery period after a horse riding accident, that we can see the successful John Lewis organisation that we are all familiar with today. He acquired the Odney site in 1926 with plans to develop it for use by the Partners, with a strong emphasis on sports activities such as swimming and tennis, these facilities are still evident. We were also shown plans that John Spedan had had drawn up of a large development of buildings to house the Partners during leisure breaks, recuperation and to generally enable them to enjoy the facilities. However, for some reason these were never built. That the Odney site was never over-developed means that it can be appreciated today as a rural retreat by the Partners, and enjoyed by visitors as well, and that it is relatively unspoilt also means that it should be possible to investigate its archaeological potential. Colin Berks has long been interested in Odney (including adjacent areas such as Sashes Island) and after much research has instigated the Odney Project. Some members of MAS and MA&HS, under his leadership, have carried out resistivity surveys and auger boring and this has revealed what appears to be a feature. To try to understand what is the nature of this feature more work needs to be done. After leaving the Heritage Centre, Colin took us on a tour of the site to show us what he thinks could be archaeological clues, such as an infilled stream or ditch that could have been a leat that might have passed through the old farmhouse grounds, suggesting that there may have been a mill there at one time. (Water courses and records suggest that here may have been other mills in the vicinity as well.) Colin walked us along a (muddy) path alongside Lullebrook and showed us what he suspects are further indications of our feature, and he is recommending additional resistivity surveys and auger boring, and maybe excavations later this year in an attempt to learn more. I should like to thank on behalf of everyone who visited the JLP Heritage Centre on Saturday: Joy Blake for organising the visit, the guides at the John Lewis Heritage Centre for taking the time to show us around and Colin Berks for the enjoyable country walk. Sadly, we have also learned of the death of Malcolm Dodwell, a former Editor of the MAS magazine, Times Past who was also well-known to members for his talents in producing very elaborate and colourful posters for talks. Malcolm was an active fieldwork member for a number of years until he was forced to step back due to work and health pressures. We extend our deepest sympathy to his family. It is with great sadness that MAS learned of the death of Nicholas Brooks, a distinguished scholar of the Anglo-Saxon period and supporter of the Society's endeavours to locate the Alfredean fort of Sashes (Sceaftesege) in the vicinity of Cookham. There is a personal tribute from Colin Berks on the Articles page. The excavation was most successful thanks to Colin Smith for site management and Joy Blake for logistics and to the many people involved. The objective of T46 was based on a guess to establish the NW rear wall of the 1776 farmhouse. This wall was revealed to be exactly where we thought it might be. See record attached, zoom in on T46 and note the flint and chalk wall aligns exactly with it in T45 not so clear is the NE end but nevertheless we now know fairly accurately the outline of the 1776 farmhouse. As previously thought the wall/cellar of the farmhouse was used to form the cellars of 1850 Rookery House, a clear section of rendered wall was revealed in T46. Elsewhere the revealed cellars were not rendered, it is concluded that what was revealed in T46 was a section of the boiler room know to be in that location. We suspect that the pre 1776 building below, possibly 1600's, revealed by chalk blockwork at the west end, was in parts under the 1776 walls. It was not possible to go deep enough on Saturday with a one day trench but this will be investigated when we excavate T47. A bonus on Saturday was a section of very nice black and red tiled floor, see photo (the 1776 wall is up the middle of the photo). Reference to Alastair's record indicates this was the Butlers Pantry or Kitchen. So in case you did not see it here it is. Archaeology invariably involves a mixture of apprehension and excitement. There is always the chance what you were looking for isn't there, but equally the anticipation of finding something unexpected can bring rewards. And that's what happened with Marlow Archaeology's excavation of The Rookery in Rookery Park that is supported by the Heritage Lottery Fund. Shallow excavations in 2011 had suggested that the former Victorian villa was built on the site of a 1775 farmhouse as early records had stated. This was successfully revealed by the excavation in March and April of this year. There was also the tentative hope that evidence might be found to link the site to the lost chapel, thought to be associated with the medieval St Thomas' hospital that once stood nearby. Excavation was far from straightforward due to unstable demolition rubble, but our team was undeterred. Despite no immediately obvious traces of the chapel, there was convincing evidence of the 18th century farmhouse. This showed in remains of the old flint walls and the cellar that had niches cut into chalk block walls, probably to hold candles or lanterns. The wine bins remained intact, although the contents had been removed! It was the chalk block walls that excited special interest. One wall in particular was of finely cut blocks and associated finds, principally of clay pipe bowls and stems, point to a tentative date of 1660 to 1680. We are now looking for documentary evidence of a 17th century building on this site. At this troubled time for the country, the Civil War was not long over and the plague had devastated many communities. So perhaps it's not surprising that documentary records and maps are hard to find. MAS extended it's survey of this area close to the town centre. New information makes it more likely that it is a ditch or watercourse. If so, material washed in which may provide important evidence about early early Marlow. Please go to the reports page for more information including plans for a training investigation on this site. So what was happening to our town between these early periods and say the 17/18th century when presumably it was evolving into what we see today. There are many theories and much speculation but no sound physical evidence. Whilst there have been a few isolated investigations from planning situations, which have not revealed much, surprisingly there has been little if any disciplined, structured archaeological investigation. MAS decided to apply its considerable fieldwork expertise to investigating this gap in our knowledge. Standard archaeological technique is to target investigation on known indicators but these are few. One indicator is that there must have been a different road system, another is the marsh and paleo channel, suggesting a very wet area adjacent to the Thames, with access to the waterside probably by causeway. It is known that boats to London were loaded with goods from the Chilterns in the vicinity of Marlow. It was decided that the only way an investigation would be productive was to survey using geophysics, all potential areas and then more or less join up the dots. There are various geophysical techniques, magnetometry is quick but doesn't work well on gravel with metallic content, resistivity has been shown to work well but is slow and is dependant on the right moisture level. Resistivity works by measuring minute variations in the grounds electrical resistance, disturbed features such as ditches and foundations hold more moisture and therefore have lower resistance, more dense features such as masonry hold less moisture and have higher resistance. If any evidence revealed is to be used in association with other evidence to build an overall picture, then any features and the surrounding area has to be accurately recorded. To achieve this English Heritage survey methods and standards have been used. The search was on for any areas that were open and accessible, having the potential of revealing the required evidence, in this great assistance was given by Tony Reeve in suggesting locations. Also important was the owners approval, in this WDC, the Town Council and various Trusts have been most helpful, in particular Neil Marshall and Morris Oram, for which we are most grateful. An initial list was drawn up and sites inspected, of these 8 seemed to have potential. The first 2 sites have now been surveyed, these are the east end of Higginson Park adjacent to the road and the north east side of Riley Recreation adjacent to Crown Lane, both sites revealed indications of early features. The area and a line of 3 twenty meter grids adjacent to the road boundary were surveyed. This area was chosen as being off the bank to the causeway and largely clear of obstruction. The readings were downloaded from the meter and sent by e-mail. On receipt the data was loaded into an analysis program for plotting and then into the CAD program containing the ground survey. In this way the position, size and configuration of any features are known to an accuracy of +-10mm. A group of anomalies were revealed at the south end against the boundary. Experience and data analysis shows that these are most probably the remnant of small structures. The configuration indicating possibly small outhouses, sheds or similar. Significant is that they are at an angle to and probably under the modern road and boundary. If this is correct the feature must pre-date the causeway and bridge. Tony Reeve supplied a copy of a print of a view from the river west of the bridge, looking towards the church, pre the current bridge and causeway. This shows a building, possibly a warehouse or similar with a track on its east face from the river to presumably the old causeway. It also faintly shows what appear to be buildings on the west side of the old causeway. It is possible that these were demolished when the modern causeway was built. It maybe that the feature we have revealed is outbuildings to these and would explain why they appear to go under the modern road. Much more investigation is required before we can be sure of what has been revealed. The same method was used as above with 5 twenty meter grids up the site south east to north west, plus another grid in the corner of the path. It had been intended to have the line of 5 grids immediately adjacent to the path but the ground was so dry no readings could be obtained, so the grid was moved over by 20m to an area with higher moisture. The grid positions were influenced by parch marks on an air photo. Whilst these parch marks can be from all manner of things they seemed to be indicating a small structure alongside the path and a larger one in the corner, this was the reason for the extra grid in the corner. Also used was a probe survey, this is a method where a steel rod is pushed into the ground and the position of solid obstructions recorded. With experience this is effective as solid brickwork or masonry sounds different from random stones etc. The lack of moisture in the ground caused problems with the resistivity readings and was very slow as at each position the meter had to wait until a reading was achieved. The method for analysis and plotting was as used on Higginson Park. The probe survey revealed a structure of about 4.3 * 8.8m alongside and about halfway up the path, consistent with the air photo parch marks. These dimensions maybe a base with the structure somewhat smaller. We are told by the Trust that there had been a relatively recent shelter in this position on a concrete base, which burnt down. The probe survey in the corner revealed indications of a rectilinear layout of bases consistent with parch marks and anomalies revealed by the resistivity. Experience indicates that these could be brick bases. The Trust tell us that there was an early building at this location, they refer to it as a pavilion. This information plus our results indicate a timber building at an angle on brick piers. Further investigation into what this was and date is underway. No evidence was found by probe or resistivity for a major building claimed as being alongside the ground, although it maybe that we were too far west to pick it up and this will be revisited when conditions are better. The major revelation was a large feature on all grids at an angle. Analysis at various points along the length, shows this to be a ditch or trench some 4m wide and 1.5m deep. Its not quite straight but is consistent along its length. The method used was to take readings at 1m intervals and it is intended to re-survey a section using 0.5m intervals which will give greater definition. Nobody seems to know what this feature is. Interpretation of this type of analysis is uncertain and all we can say for the moment is that it could be a recent service trench or an old boundary or drainage ditch or a stream or glacial feature. As standard practice a search was made for any manholes or other indications of a modern feature but none relevant found, the Trust also have no recollection of a service trench at this point. Marlow Society are investigating if any documents help to explain what this is. All possible modern explanations must be eliminated before consideration is given to it being ancient and needing further investigation. One aspect of these investigations that was most interesting was the number of people who stopped to tell us what they remembered about the sites. Some of this information helped us with the interpretation. Some people were so interested that they joined the Society on the spot. Significant were the number of young people from local schools who expressed intelligent interest. Food for thought were the number of these who said that their school should be more involved with this type of investigation and the history of the town. Further investigation will be done on these two sites and a number of others, information on these will be on posters and sent to society members. If you want to know more, would like to join the Society and or would like to be involved or would just like to watch, contact. The summer is proving a busy time for Marlow Archaeological Society. Investigations are continuing at the National Trust's Cliveden estate, following the uncovering of a previously unknown major brick structure last year. This dated from the 17th century but its purpose remains a mystery. The present focus is on tracing an early entrance to the site across the Taplow Common area. But Marlow remains a priority and a survey in Higginson Park earlier this month, has revealed what may be the remains of a building that pre dated the present bridge. More work in the Causeway area is planned. And on 8th July, if the weather is kind, a survey of Riley Park may help settle speculation about the past patterns of roads or tracks in this area of Marlow. Looking further ahead, an extensive fieldwalk of the Low Grounds site affected by the planned flood alleviation scheme is being planned for the autumn. Also in the autumn, the programme of talks kicks off with the return of Julian Richards of "Meet the Ancestors" and Stonehenge fame. His talk on "The Changing Face of Death" will be in Liston Hall on 28 September. Tickets will be on sale shortly. Organising Fieldwork involves the agreement and approval of, Landowners and Archaeological Authorities. MAS always works in accordance with relevant regulations and guidelines, issued by English Heritage, IFA, County etc., which have approval and procedural requirements. This policy has resulted in MAS gaining considerable credibility, leading to approvals for major site works but is very demanding. Access agreements have to be signed, insurance requirements and risk assessment satisfied. Last but by no means least, dates have to be agreed, people contacted, informed and organised as do any equipment required. This can be a massive task made more difficult when landowners and similar keep changing things. A survey to identify possible archaeology was carried out by Wessex Archaeology, MAS was asked by the National Trust to carry out more detailed investigation of certain areas using survey, geophysics and excavation. Phase 1,investigation of small areas of exposed brickwork on Green Drive. This with post excavation research and analysis was completed towards the end of 2009. The feature when fully revealed turned out to be much larger than anybody anticipated. There was a substantial structure some 40m long, consisting of a 0.75m thick wall with 8m long returns, plus other subsidiary structures. Analysis of the data indicated that there had been several phases of construction and alteration. Fortunately there were many finds in identifiable contexts, particularly a large number of clay pipes and glass shards. Anne and Ray Spencer did some excellent research into the clay pipes, revealing that they were of two main periods of about 1660 and 1725, dating of some of the glass confirmed these periods. The conclusion is that these dates indicate the major construction events. Pam Knight is producing a report on historic association so as to relate phases of building to historic events. This structure is apparently an architectural statement as would be used on a main entrance but its position is inconsistent with what is known about the early roads and access. An illustrated talk on this phase of the investigation and results will be given at the MAS AGM on Thursday 20th May. Phase 1A. There is slight evidence for a very early entrance that might be consistent with an entrance gate at the position above. This would pass across Taplow Common to join the road north of the current entrance. Also there are apparent earthworks on this common that have no explanation. The next fieldwork therefore is a resistivity survey, south to north, over these earthworks and the possible line of the suspected road. Associated with this will be a contour survey so as to be able to relate the geophysics to apparent features. Depending on what is revealed this fieldwork may be extended. MAS is currently waiting for formal permission for this work but this is anticipated soon. Further phases. The instruction from NT also covers resistivity over the large areas of the front and back lawns and a detailed survey record of a very large area known as the Pheasant area about a mile south of the house. Also we would like to investigate the position of the Manfield house shown on a 1580>1608 plan which pre dates all known buildings. Investigation by MAS over a number of years has revealed significant archaeology, examples being, a Mesolithic mortuary enclosure, 3 Barrows (Bronze Age? ), the possibility of a Neolithic Long Barrow or Causeway and most significant a Neolithic Tannery. The two southern Barrows, known as "A" south and "B" centre, showed intriguing anomalies. "A" has a double ditch with indications of something rectangular at the centre, this raises the slight possibility of a burial chamber. "B" is a single ditch with the north east part having been damaged but geophysics shows the other sections to be relatively intact. The south west section of the ditch shows anomalies on both magnetometer and resistivity plots that by comparison with other sites maybe cist burials. The Environment Agency are proposing to carry out flood protection works involving this area. Of significance is a proposed lake to hold back flood water, whilst this is being kept clear of the Barrows, it is intended to spread the excavated material over the Barrows, making further investigation difficult. County have made representation that MAS be allowed to carry out some further investigation and discussions with EA have produced agreement that MAS will be allowed access for a few weeks prior to the works commencing. A WSI and cost plan has been produced and submitted and it was thought that MAS would be given access shortly after Easter. However we have just learnt that due to complications the works may not now commence until 2011. Response to proposals is awaited and you will be informed as soon as we know. Prior to the current bridge and causeway, the Thames crossing and through road was along Saint Peter Street with a bridge to what is now the restaurant lawn on the south bank. Until fairly recently there were warehouses on the north bank just south of the current bridge where the flats are now. Whilst there is no firm evidence there are indications that warehouses, perhaps workshops and cottages and a road were on what is now the causeway and east end of Higginson Park. 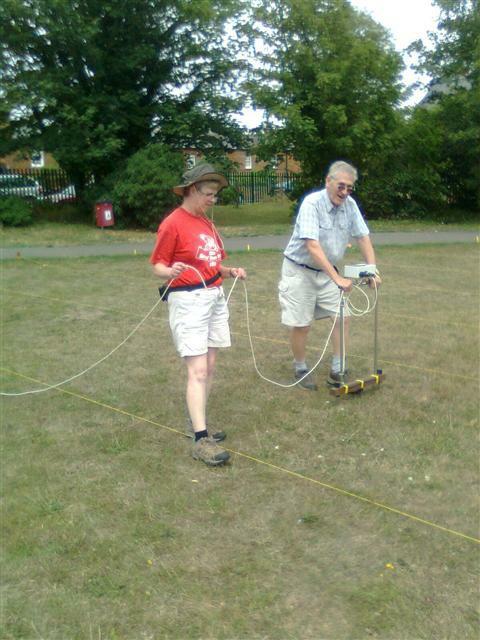 We made a proposal to the Higginson Trust, Town Council and WDC for permission to carry out an archaeological investigation of this area, initially using Resistivity. Permission has just been received and Peter Borrows will be sending out more detail shortly. This is the area alongside Crown Lane, between the Central Car Park (Waitrose) and Cambridge Road. There are suspicions that there may have been an early road with buildings across this Park, possibly joining Dukes Place and Morris Place to the corner on Oxford Road. There is no evidence only logic based on early road layout and type of traffic. Discussions have taken place and a proposal made to the Riley Trust for a geophysics investigation. These were favourably received and we await confirmation of permission. Some MAS members are assisting with the current investigations by TWAS in association with the Universities, part of the Burg to Borough Project. This is mainly test trenches and geophysics and useful experience. If you wish to take part contact TWAS website.